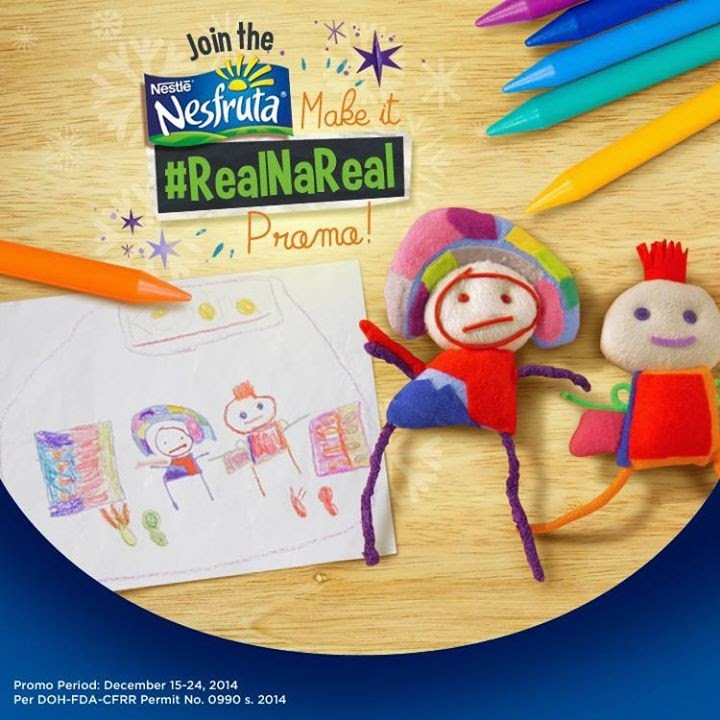 Make Your Child's Drawing #RealNaReal with Nesfruta! Do you remember how it was when you were little and you'd imagine you're like a princess? I did that a lot of times! When I was waiting for my school bus to fetch me from school, I would pretend to be a princess going down the school's staircase. When not in an imaginative action, I draw whatever I wish was real! Like having a big house with a pool or riding an airplane. Same thing goes for my children. They love coloring and drawing whatever fancies their imagination. 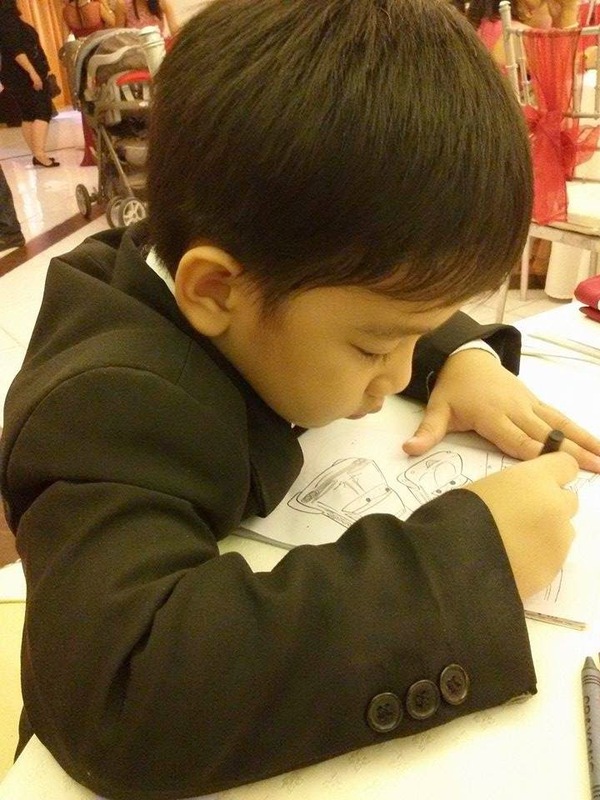 This little boy is seriously minding his activity at a formal event we attended to recently. 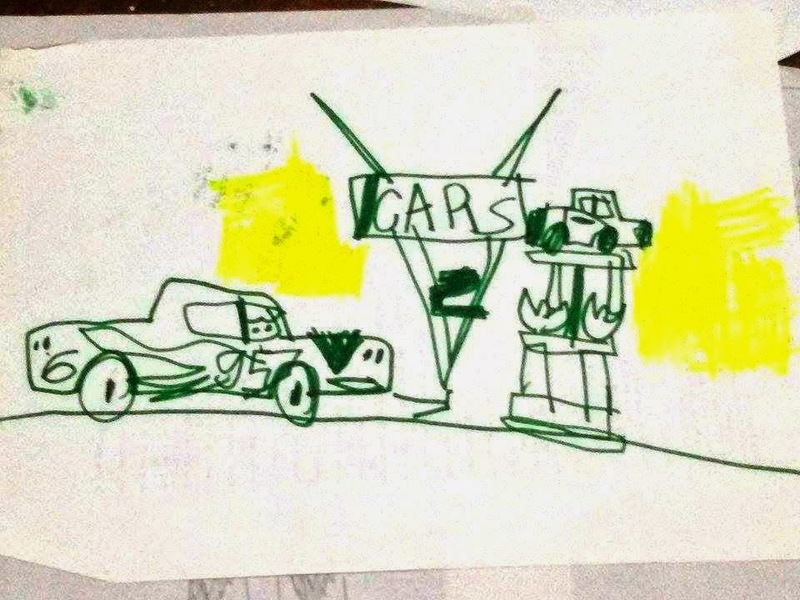 They have drawn robots, houses and cars and they are most precious to me! That's why I kept each and every drawing of theirs so they will have something to look back on when they will be grown-up men someday. Did you see the surprised reaction on the faces of the kids? PRICELESS!!! 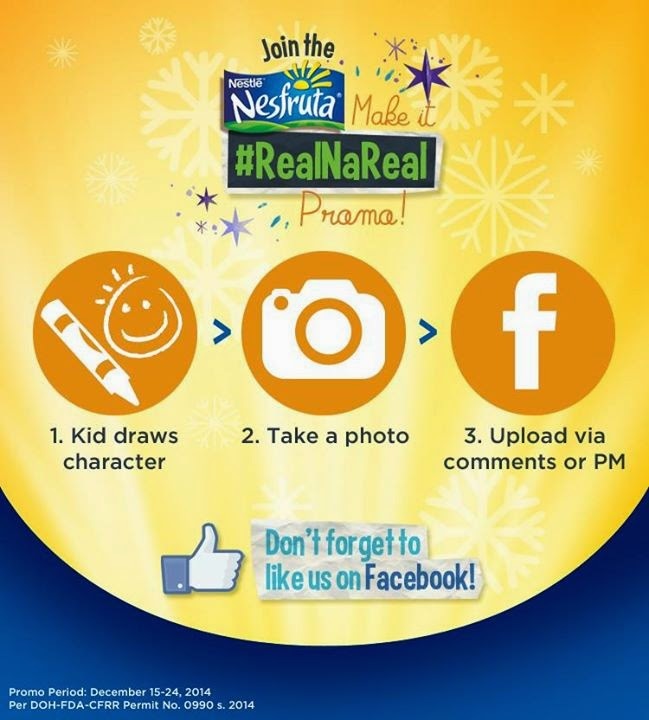 You too may have a chance to make your children's drawings become real by joining the Nesfruta Make it #RealNaReal Promo. 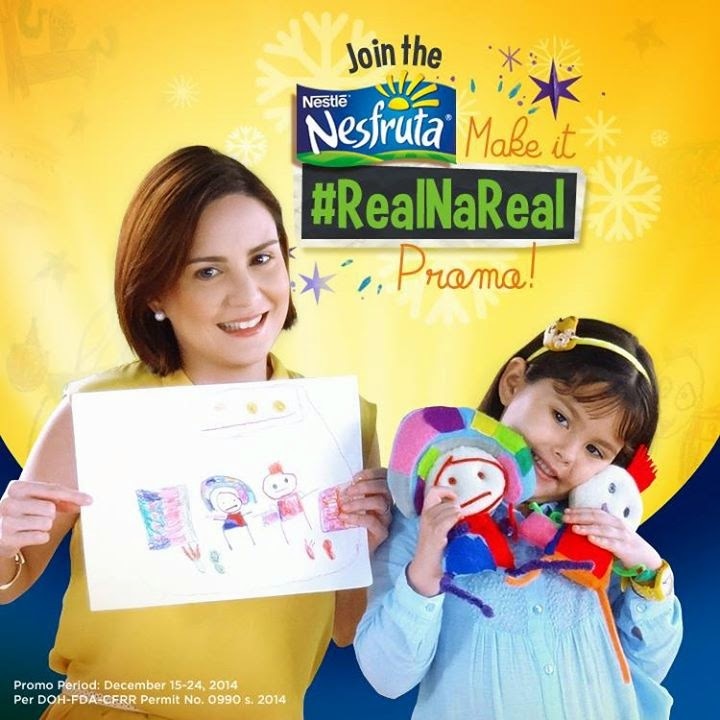 Visit Nesfruta Contest Facebook Page for the full mechanics with terms and conditions: http://bit.ly/nesfrutamakeitreal. To join the promo, a participant must upload a photo of his or her child’s drawing by commenting on the promo post or by sending a private message to the NESFRUTA Facebook Page. 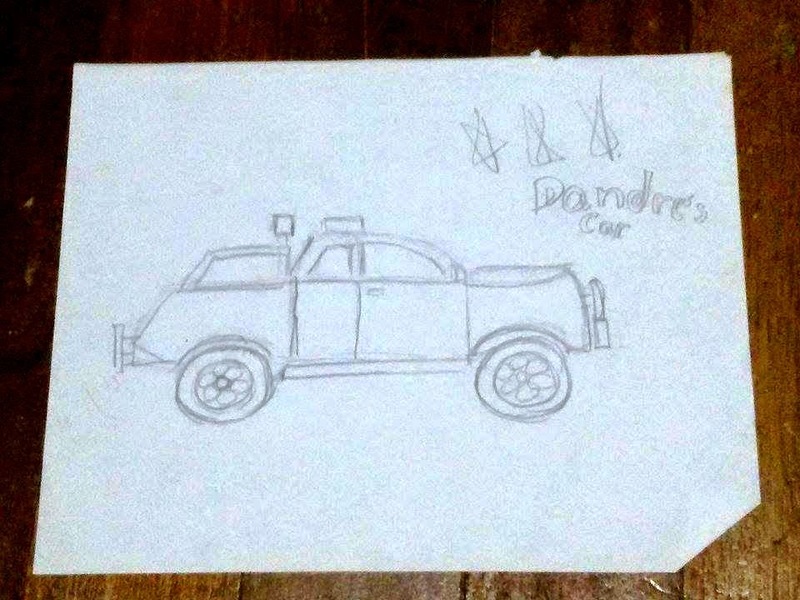 The child who made the drawing must be aged 7 years old and above. Drawing must only have one character. 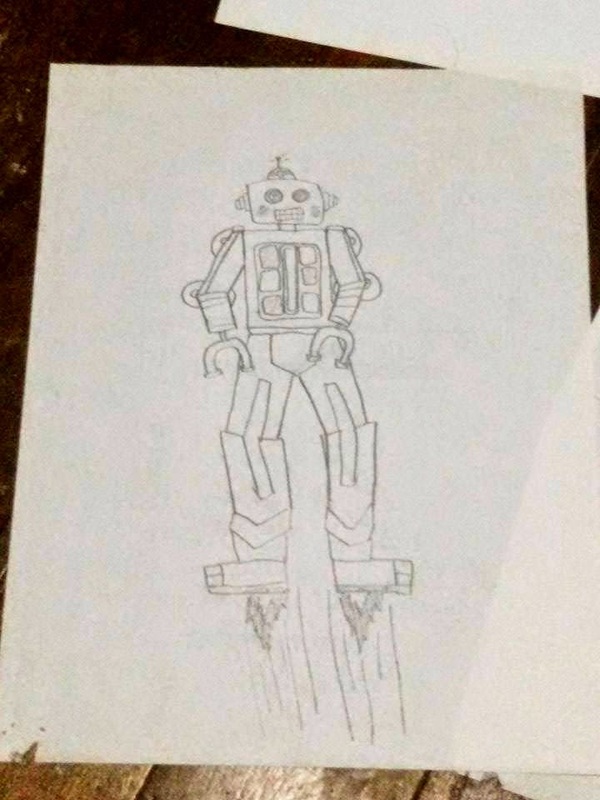 The toy to be created out of the drawing is safe and will not put children at risk. The toy to be created meets quality standards of promo organizers. Participants can send in as many entries as they like, provided that each submission is of a different drawing. Only valid entries will be included in the weekly raffle draw. Here's what you may win! Five (5) weekly winners will be drawn to each win one (1) toy replica of the submitted drawing, for a total of ten (10) winners. As a parent we capitalize on their thirst for knowledge by giving them books,puzzles,and mentally stimulating games. I let them watch educational programs and listen to different kinds of music. I even enroll them in enrichment classes to help them get a leg up in school. But sometimes, we forgot that any activity, whether is physical or mental, requires energy. As we know, most of our energy comes from the food we eat. Their diet which includes lots of kiddie treats, my cause their energy supply to rise and fall w/out warning. So for my child brain's to keep performing at its best, its needs a consistent supply of energy to last through an entire day of learning. And that' s exactly what Progress Pre-Shool GOLD Aims to deliver! As parents, I capitalize on their thirst for knowledge by giving them books,puzzles,and mentally stimulating games. I let them watch educational programs and listen to different kinds of music. I even enroll them in enrichment classes to help them get a leg up in school. But sometimes, I forget that any activity, whether physical or mental, requires energy. As we know, most of our energy comes from the food we eat.Their diet which include lots of kiddie treats, may cause their energy supply to rise and fall w/out warning. So for your child's brain to keep performing at its best its need a consistent supply of energy to last through an entire day of learning. And that's exactly what Progress Pre-Shool GOLD aim to deliver and developing multiple intelligence. I help my kids develop their Multiple Intelligence by exposing them to different kinds of activities. I let them play, read, sing, dance and get into sports or school clubs. Being able to let them experience every activities available will let them enhance their skills, knowledge and develop those that they like to do in the future. As a parent, I capitalize on their thirst for knowledge by giving them books,puzzle, and mentally stimulating games.I let them watch them educationa programs and listen to different kinds of music. I even enroll them in enrichment classes to help them get a leg up in school. But sometimes we forgot that any activity, whether physical or mental, requires energy. As we know, most of our energy comes from the food we eat . Unfortunately for my children, their diet which include lots of kiddie treats, may cause their energy supply to rise and fall without warning. So for my child's brain to keep performing at its best, it needs a consistent supply of energy to last through an entire day of learning And that's exactly Progress Pre-Shool GOLD aims to deliver and developing multiple intelligence! As a parent, I capitalize on their thirst for knowledge by giving them books, puzzles, and mentally stimulating games. I let them watch educational programs and listen to different kinds of music. I even enroll them in enrichment classes to help them get a leg up in school.But sometimes, we forgot that any activity, whether physical or mental, requires energy . As we know, most of our energy comes from the food we eat. Unfortunately for my children, their diet, which include lots of kiddie treat, my cause their energy supply to rise and fall without warning. So for my child's brain to keep performing at its best, it needs a consistent supply of energy to last through an entire day of learning. And that's exactly what Progress Pre-School GOLD aims to deliver and developing my child multiple intelligence! 1. Make use of his senses to learn all things, living and non-living things. 2. Playing with the child using blocks puzzle, and video games. 3. Do activities with the child that involves in sports, music, and arts. 4. Bring the child to playground or park or to his cousin house to make him to interact with other child and peolple. 5. Let the child watch educational videos, especially those videos that has moral lesson and activities. 6. Filter all the bad things he could learn from the above as possible. 7. If can't be avoided the bad things, explain why he/she must not do that in more calm or relaxed voice. If possible giving him a tablet or other video game console will make the child develop faster all his intelligence. Because in the table and video games they learned many things. From image, sound, dimension, singing, reasoning, interacting, identifying, solving, logical, hypothesis, evidence, diagnostic, refinement, inconsistency, sensitivity, conclusions, evaluationand, theory, and a lot more. The only things missing are to develop or learn the existential intelligence which is required to develop spiritual knowledege and human science, and bodily-kinesthetic Intelligence which is required to develop strong physical skills. Hello Oo bkt Hindi Oo mapost ung comment KO? As a parent, we capitalize on their thirst for knowledge by giving them books,puzzles and mentally stimulating games. I let them watch educational programs and listen to different kinds of music. I even enroll them in enrichment classes to help them get aleg up in school. But sometimes, we forget that any activity,whether physical or mental, requires energy. As we know, most of our energy comes from the food we eat. Unfortunately for my children, their diet, which include lots of kiddie treats, may cause their energy supply to rise and fall without warning. So for my child brain to keep performing at its best it needs a consistent supply of energy to last through an entire day of learning. And that's exactly what Progress Pre-School GOLD aims to deliver and developing multiple intelligence! I support my child's multiple intelligence by letting her do things by herself and explore her surroundings at the same time learning by experience. We all know that the best way of learning is by doing things by practice and application. More than the things we read from books or by the internet, it is important to let our children learn by exploring their capacity based from what they experience, see, observe from their surroundings. That's what I do with my daughter, I let her learn everything by process and at the same time educating her with what she has to learn and supporting her all the way. How do you develop your children's multiple intelligence? I can help my child to develop his/her Multiple Intelligences just by spending time with them. Like the " People Smart " to Develop this intelligence by emphasising and encouraging my child to demonstrate positive behavior in their relationships with others. i can Enroll my child in extracurricular group activities and encourage them to invite their friends over to play. Help them to understand positive behavior by modeling positive behavior too. Children , They will be polite if you are polite, they will listen to you when you are talking if you listen to them when they are talking. As parents, we can help our children become smarter in many ways by exposing our children to a rich array of learning activities that develop their many ways of being smart. I develop my child's multiple intelligence by developing his bodily-kinesthetic intelligence in which I let him use his body in a skilled way, for self-expression or toward a goal. I let him dance, act and play with others to develop not only his body but also his emotions. I develop my child's multiple intelligence by introducing different kinds of play! like letting and encouraging her to play different musical instrument,i discovered that she has a talent in guitar!letting her play in the sand and make a house castle out of it,letting her play in the rain and tell her what rain can do.. sometimes in our simple ways a child can learn! I encourage my child to be body smart. When he plays, he is creating the foundation for his intellectual, social, physical and emotional skills. I let him play outside and even bathe in rain for him to experience the joy even in small things other than what gadgets nowadays bring. Physical exercise does not only make my child strong, but it also forms a connection between me and my kid that will provide him a foundation for his higher thinking skills. I help my 6-year-old daughter develop multiple intelligence by supporting her passion in collecting activity books (puzzle, word search) and story books. I let her play indoor and outdoor with friends. Involve her in all activities she's interested in like cooking (Her dream is to be good a Chef like Chef Boy Logro). As a part of our bonding, we exercise and run together on weekends. To achieve all this, I give her the proper nutrition by preparing healthy meals everyday. As a parent I develop her multiple intelligence by encourage her to discuss books she has read with you. We read books together and explore topics and talk about them at an age-appropriate level. I provide her to opportunities to paint, color, design.I give her 3-D activities like solving mazes challenge his creativity, and encourage her to design building or clothing. I teach her to build paper airplanes create oregano, or try knitting. I also expose her to multi cultural book and experiences,encourage dramatic activities and role playing. I enroll her in dance and singing classes and sometimes in free workshop. I help her set goals and encourage independent project. I take her to science museum, exhibit and zoos, and be patient with his questioning as she may ask over and over again. And finally I give her nutritious food and give her Progress Pre-School GOLD TO HELP her developing MULTIPLE INTELLIGENCE.